As you know, Canada has legalized euthanasia (euphemistically called "medical assistance in dying”). Bill C-14 was enacted under the pretext of assisted suicide. That's not what Canada got. The second federal report on Canada's new assisted suicide law reveals that less than 1per cent of deaths were self-administered. The rest were lethal injections -- administered at taxpayers' expense -- regardless of whether they object! By definition, that's state-sponsored euthanasia not assisted suicide. 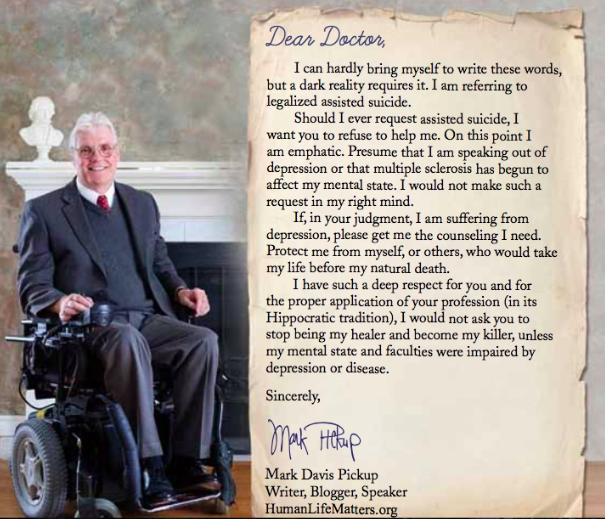 It is not medical assistance in dying, it is medical killing. Being one of the vulnerable target group, I asked my physician to put the note below on my file. I removed her name as a courtesy. She is not one of the killer-doctors. American readers of this blog should use Canada as a lesson of what not to do. State-sanctioned euthanasia always turns bad.